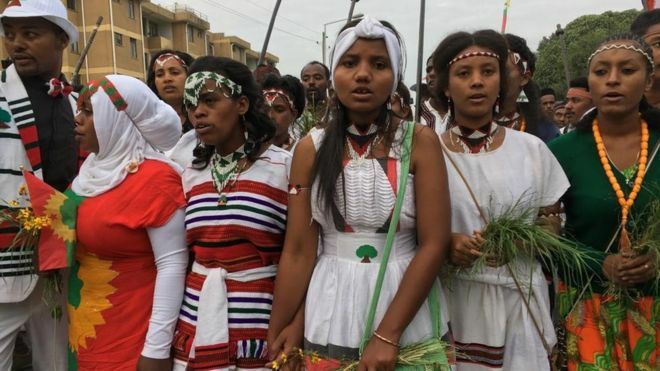 Irreecha (Irreessa) Birraa Oromoo kan Bara 2018 (akka lakkoobsa Oromootti kan Bara 6412) Fulbaana 30 Bara 2018 Hora Arsadeetti Irreeffatama. 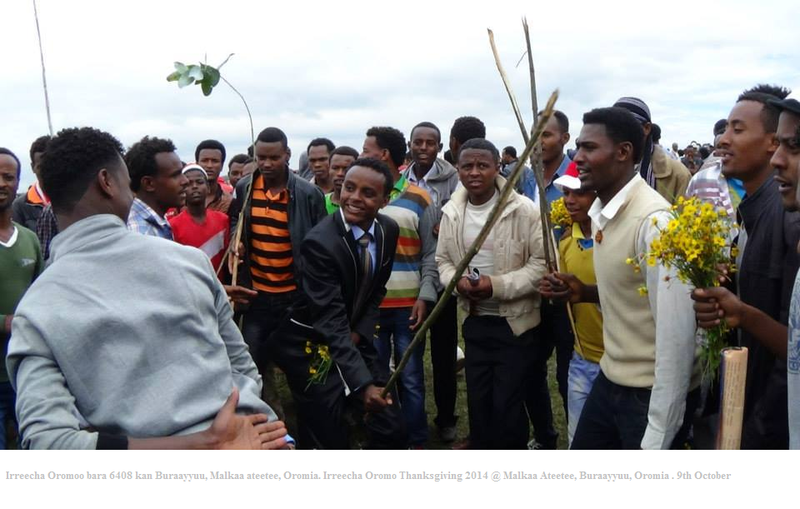 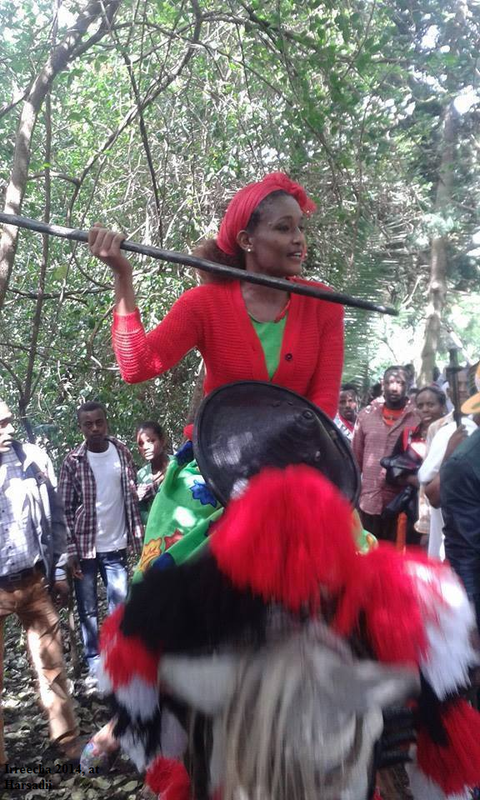 Irreecha Oromo Thanksgiving 2018 (6412 in Oromo Calendar) Celebration at Hora Arsadee, Bishoftuu, Oromia, on Sunday 30 September 2018. 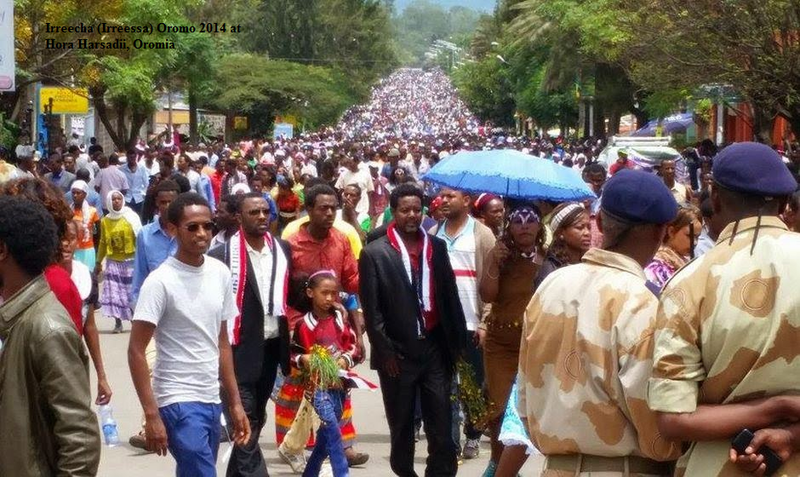 Jala bultii Irreecha bara 2018 irratti baazaariin Fifinnee Galma Aadaa Oromootti banameera. 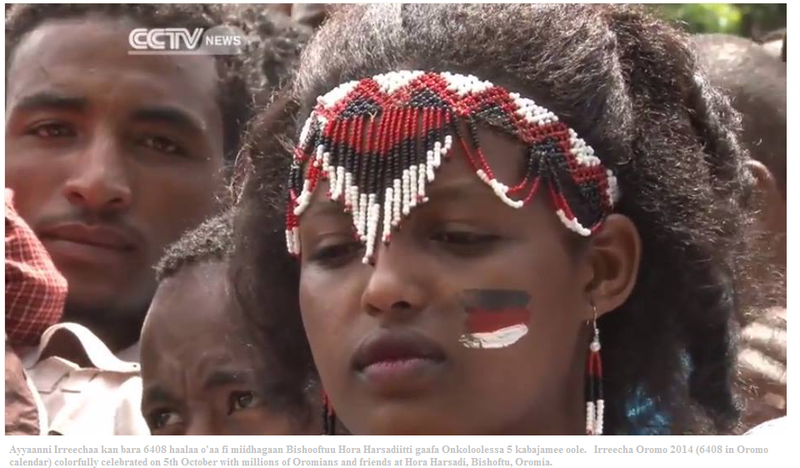 Suuraa hanga tokko asi tuqaatii marsaa BBC Afaan Oromoo irraa ilaalaa. 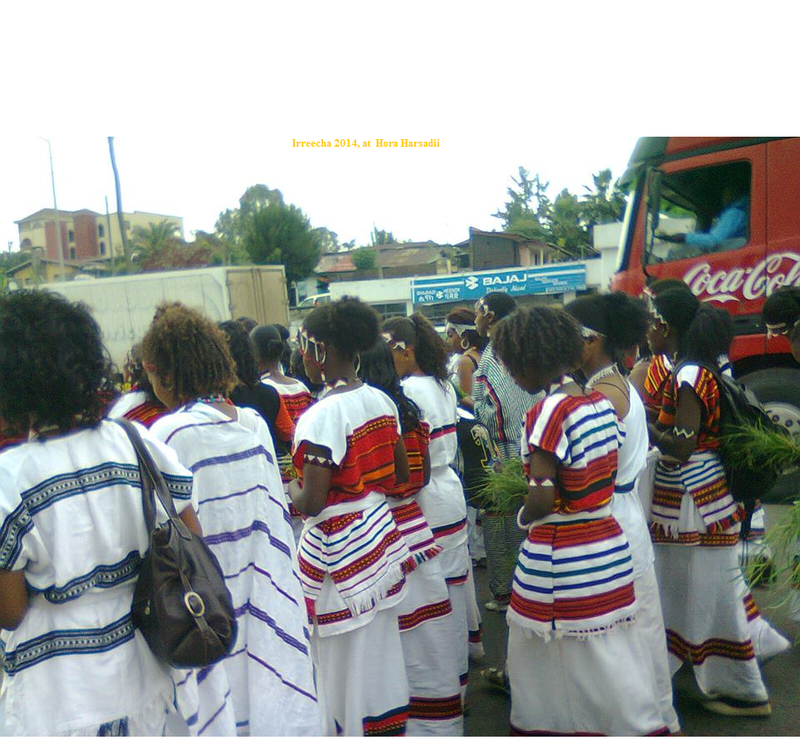 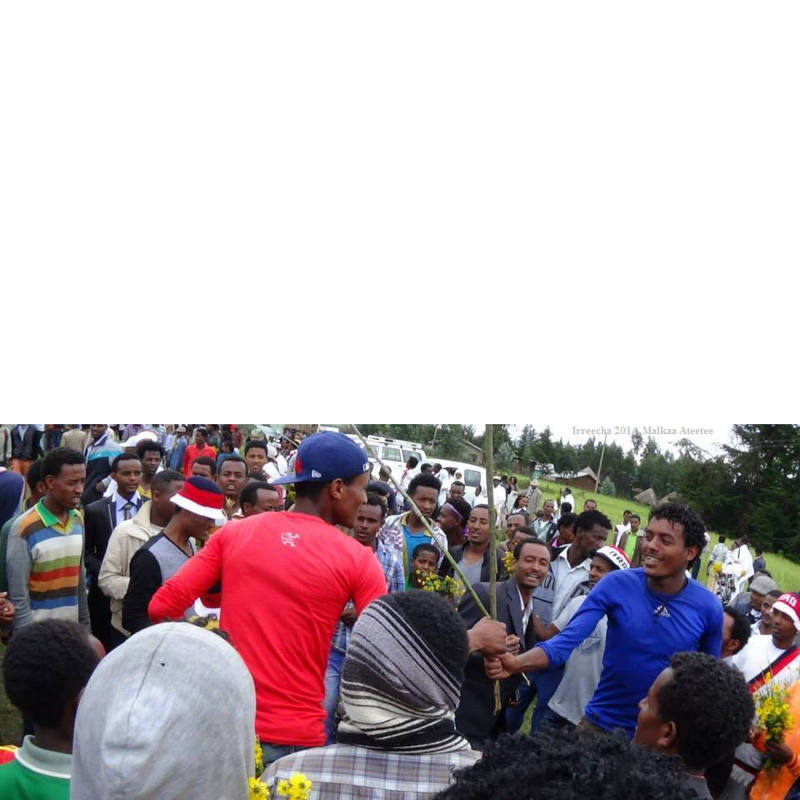 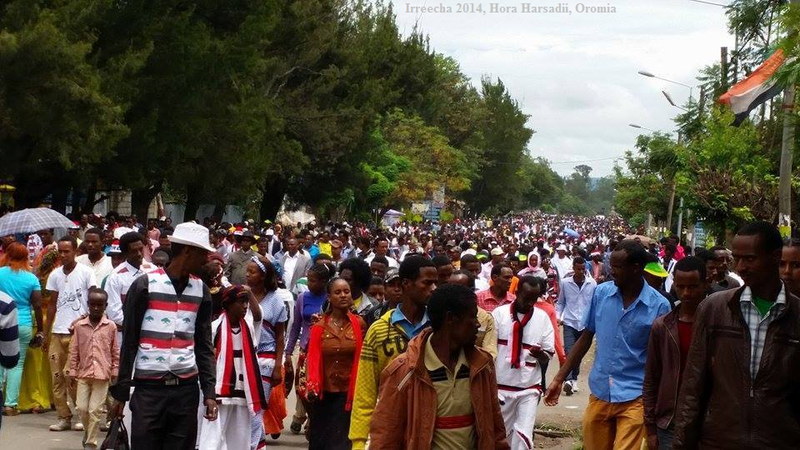 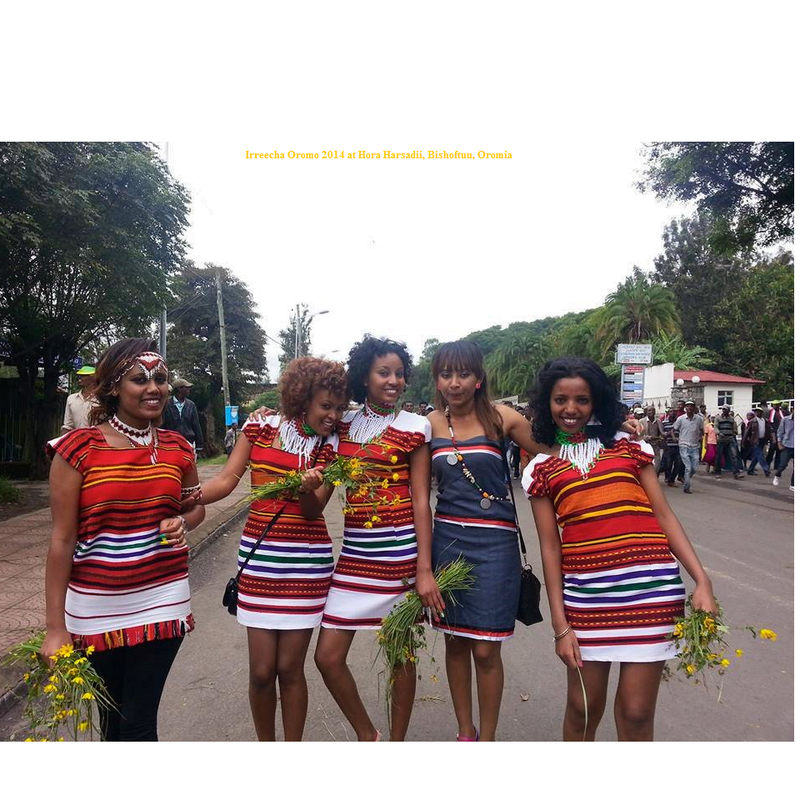 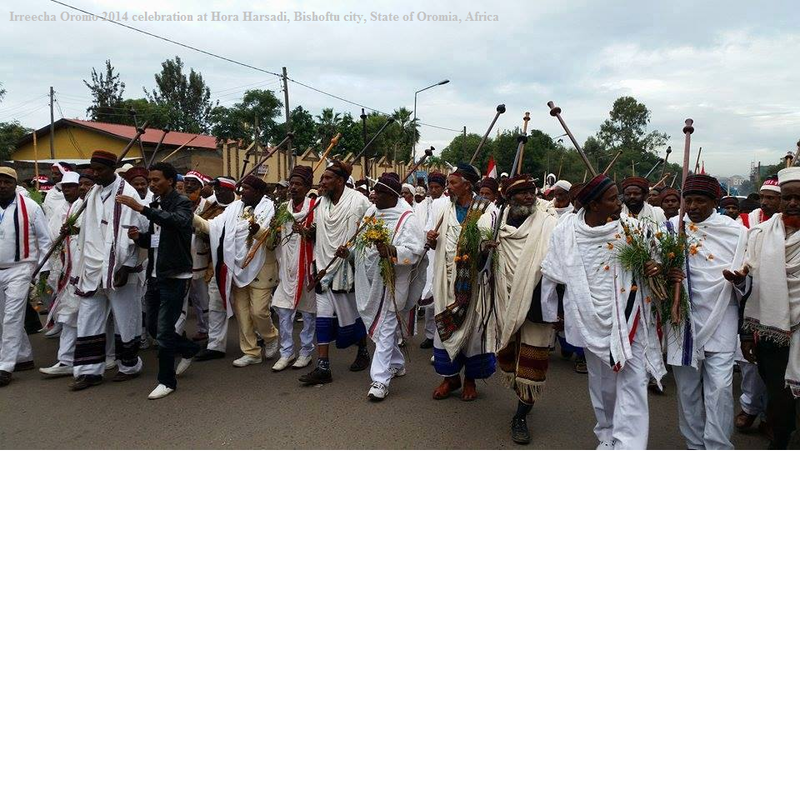 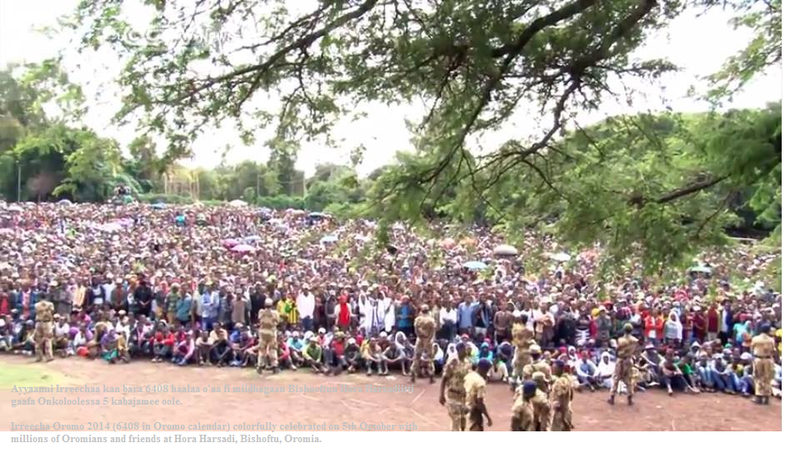 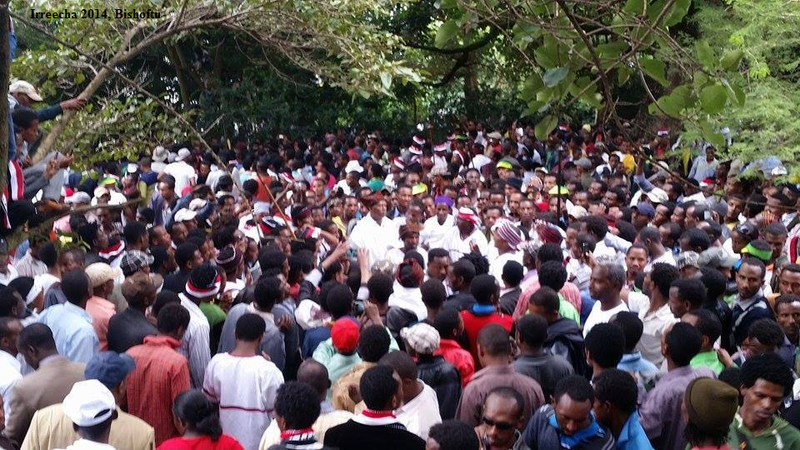 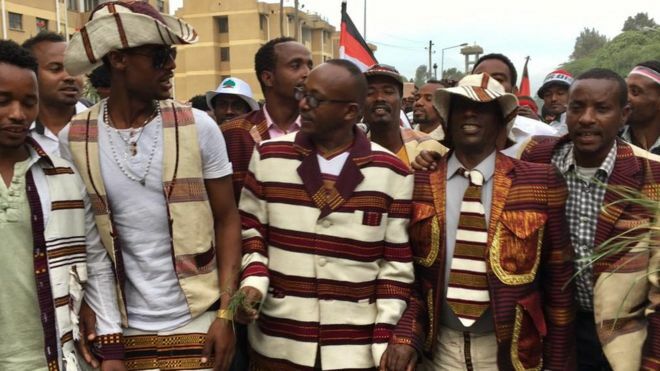 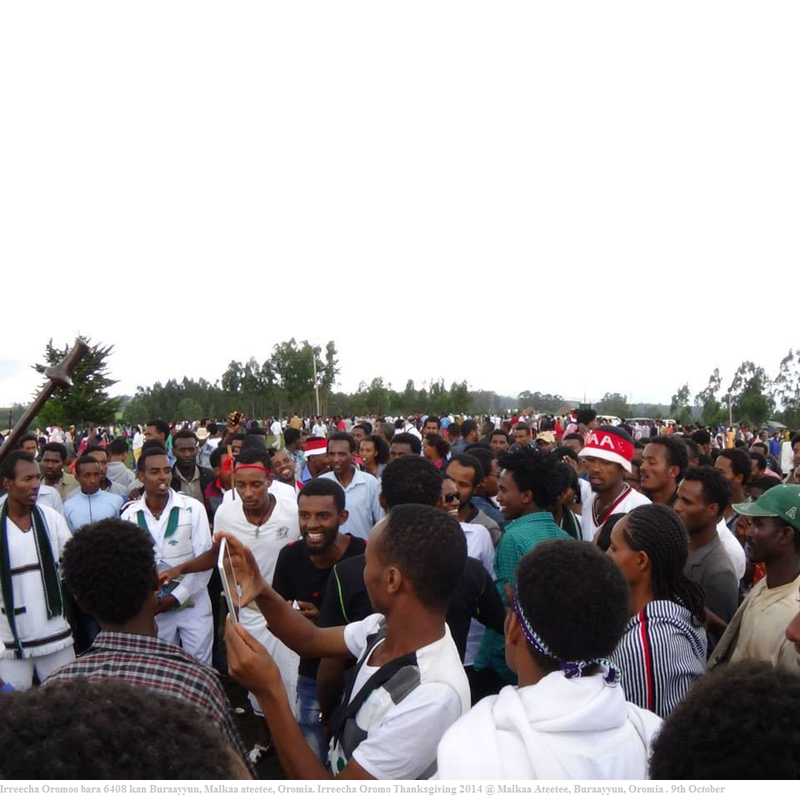 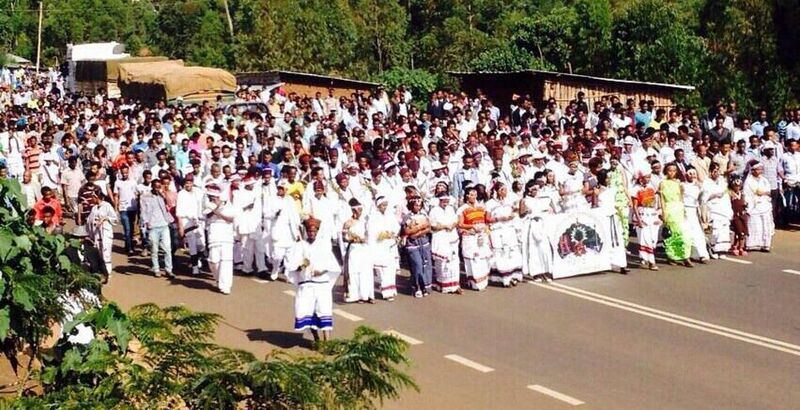 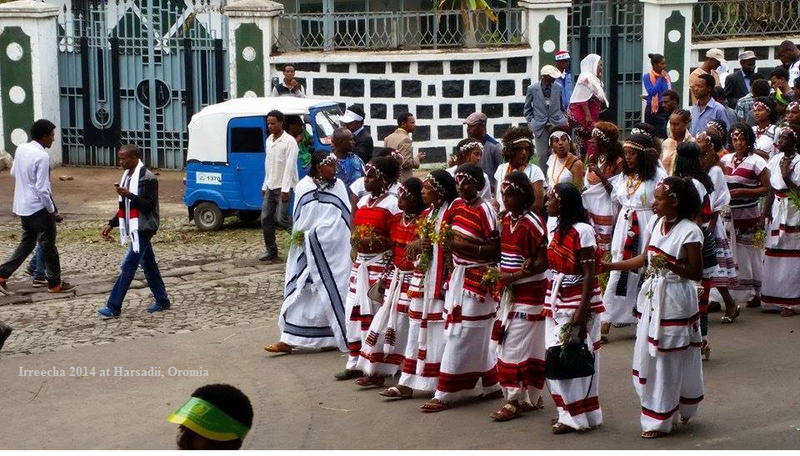 Posted by OromianEconomist in Culture, Irreecha, Irreecha (Irreesa) 2014, Irreecha (Irreessa) 2014, Irreecha Birraa, Oromo, Oromo Culture. 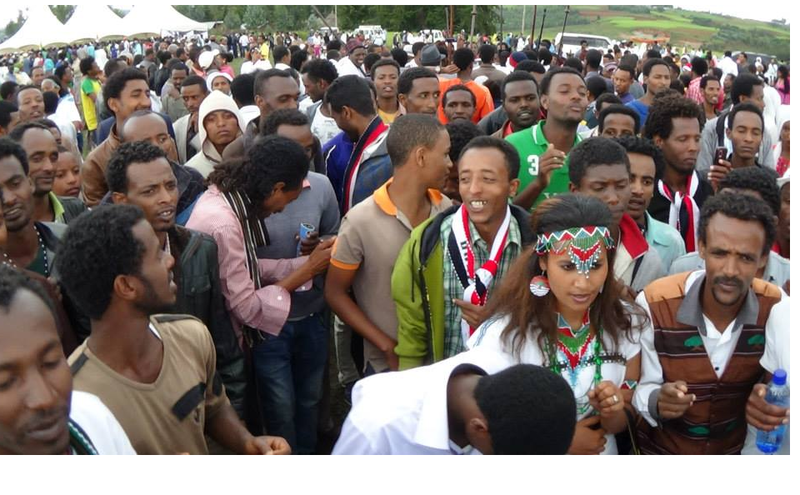 Face Book page of Known Oromo Journalist Dhabasa Wakjira, Bitootessa (March), 17, 2015. 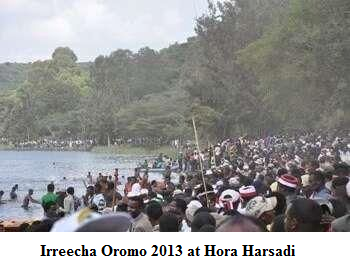 This historical Irreechaa celebration was captured 112 years ago- 1903 at Lake Hora, Bishoftu town. 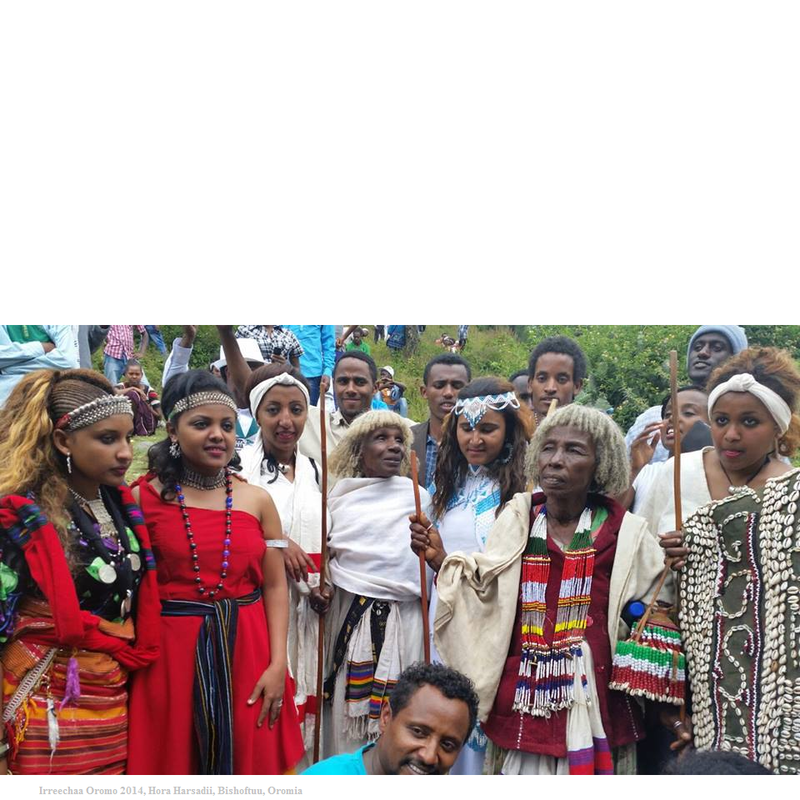 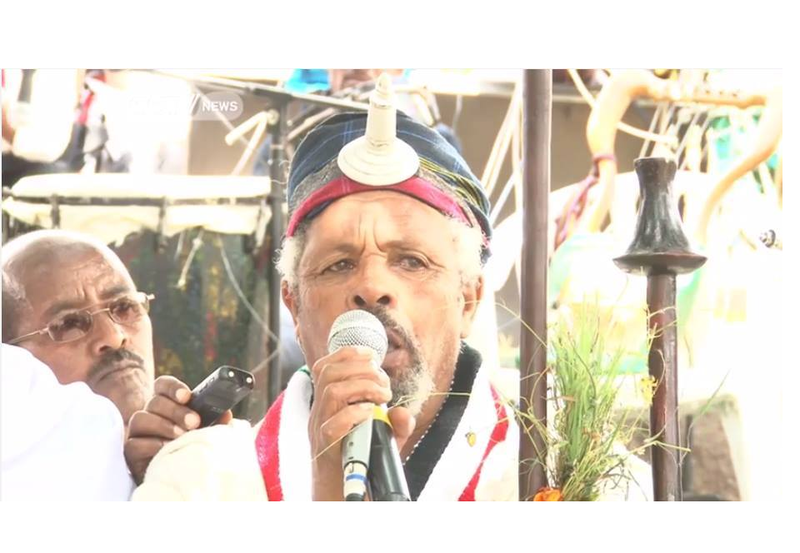 Irreechaa is one of the indigenous Oromo culture by which Oromos are getting together to thank their Creator called Waaqaa or God for the reason that He helped them to turn a year. 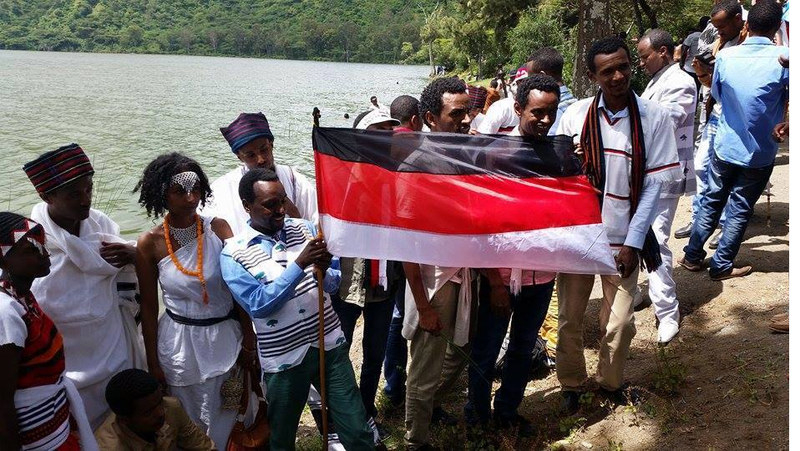 For a reason that God or Waaqaa transferred them from the rainy and difficult season to a shiny and enjoyable season Oromos are getting together and give their thanks for the Great Lord I .e. 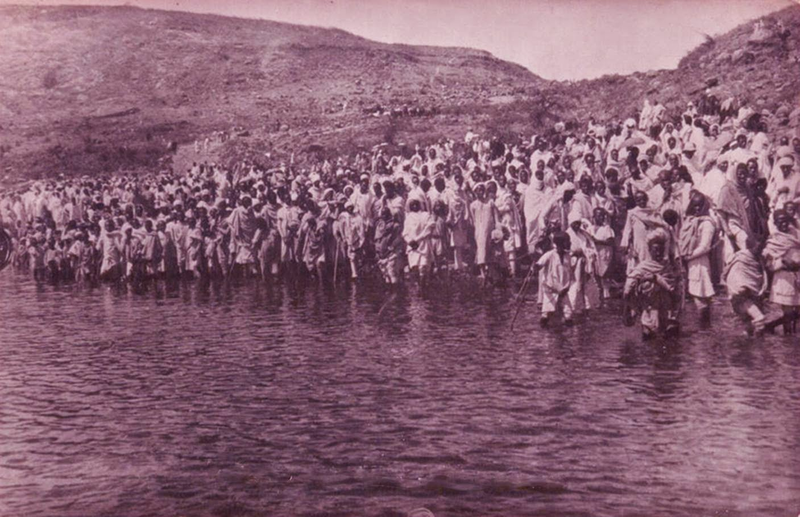 Waaqaa or God. 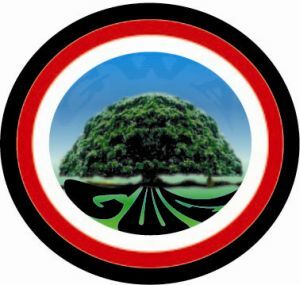 It was then banned and the banning era was ended with the fall down of Mengistu’s regime in 1991. 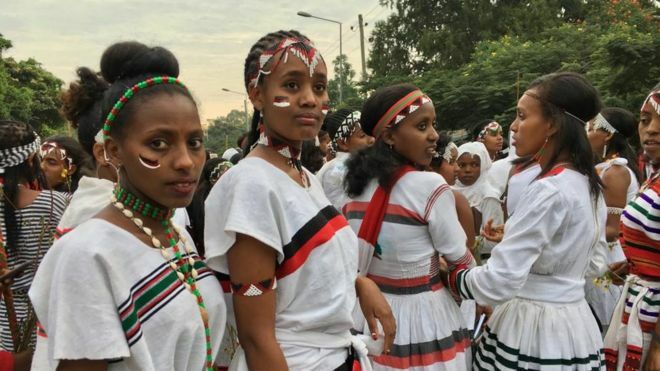 The Oromo people celebrate Irreechaa to thank Waaqaa (God) for the blessings and mercies they have received throughout the previous year. 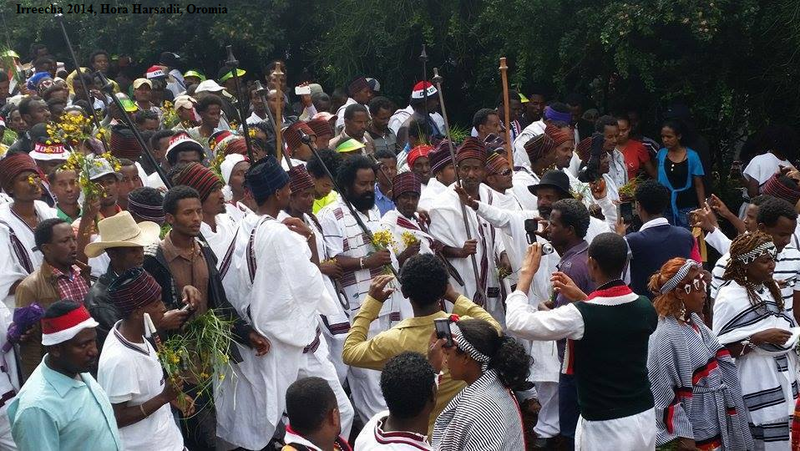 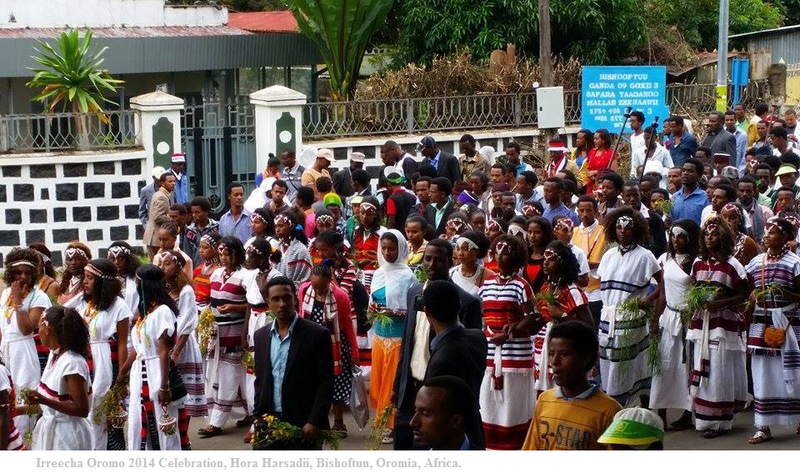 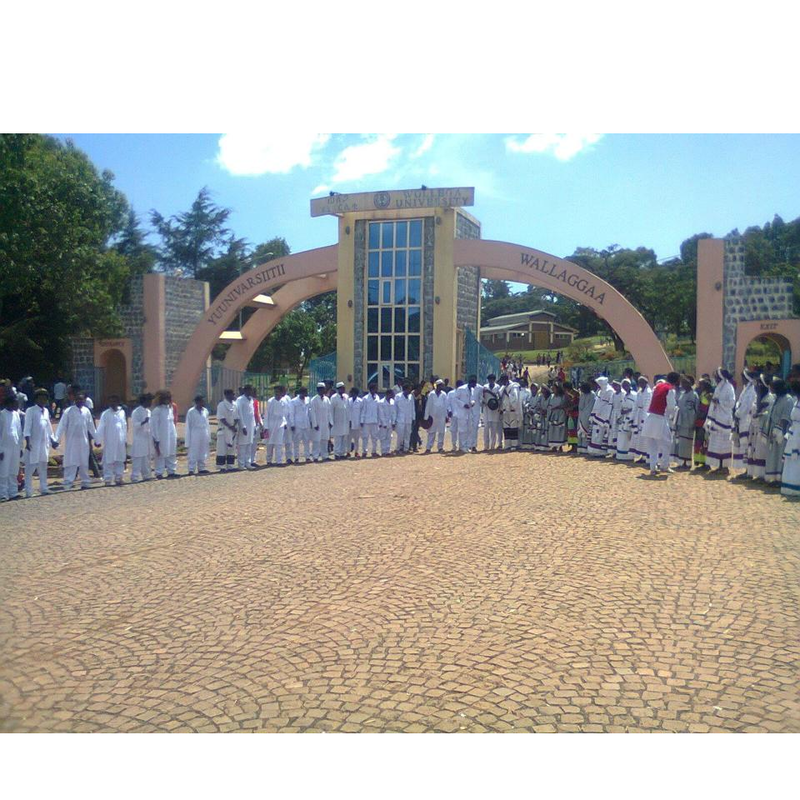 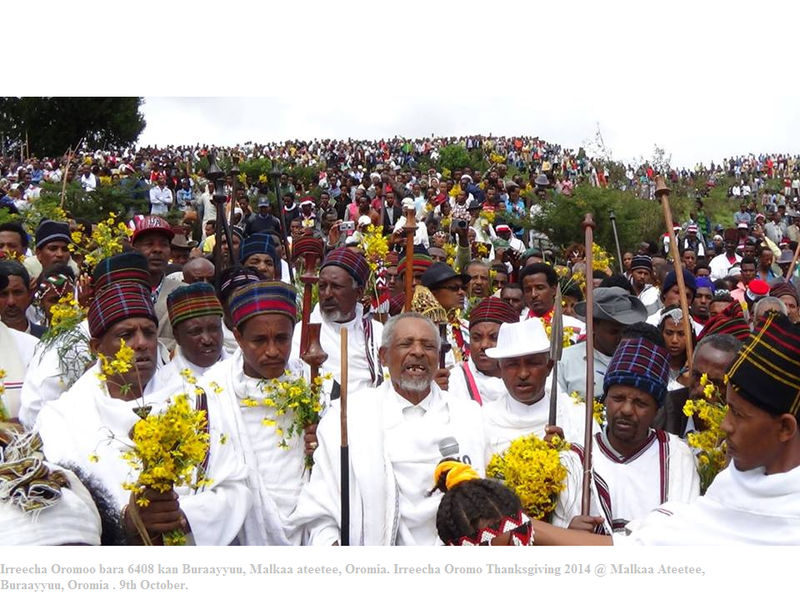 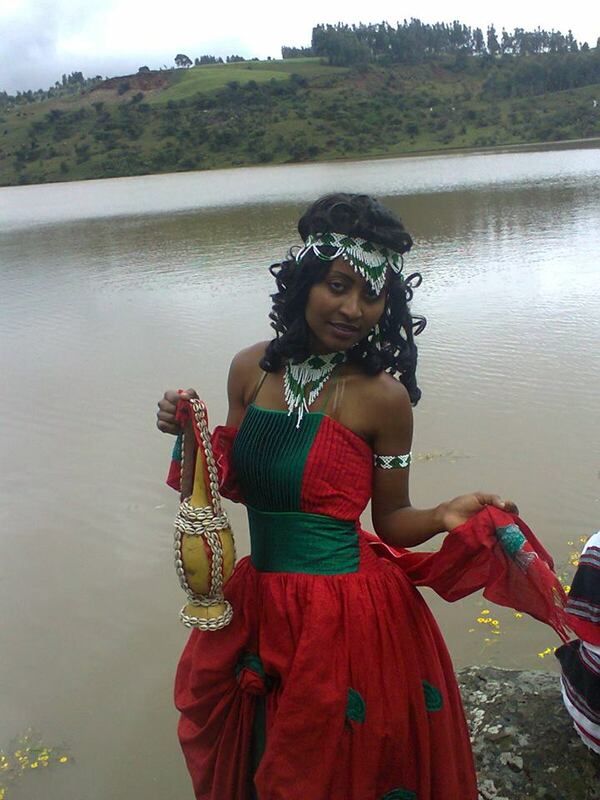 The thanksgiving is celebrated at the sacred grounds of Hora Harsadi (Lake Harsadi), Bishoftu, Oromia. 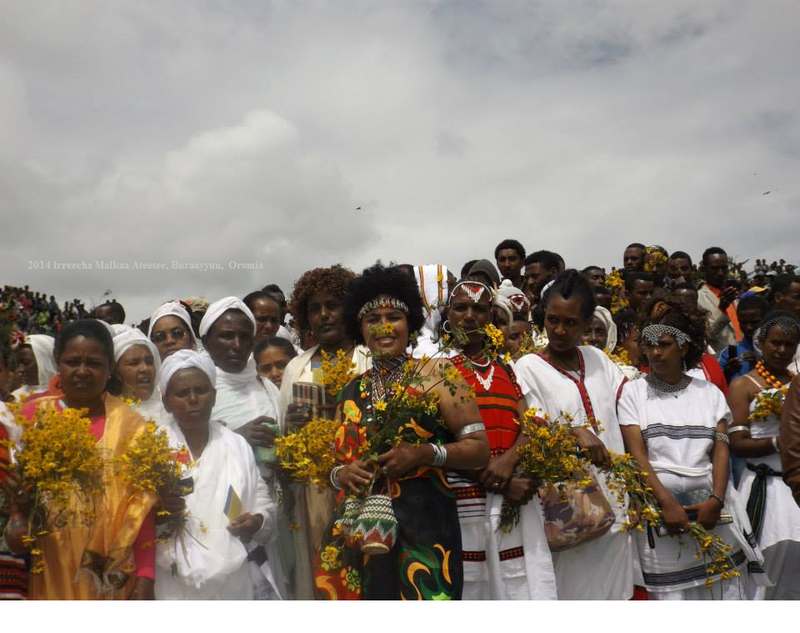 The Irreechaa festival is celebrated every year at the beginning of Birraa (the sunny new season after the dark, rainy winter season). 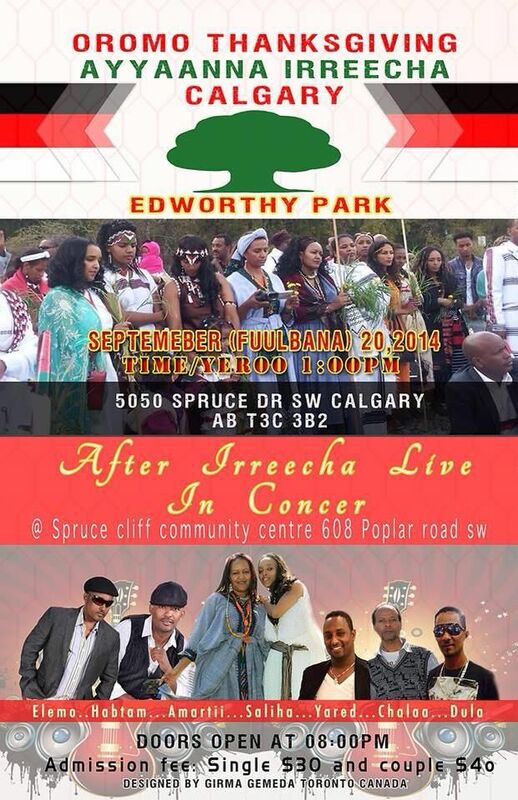 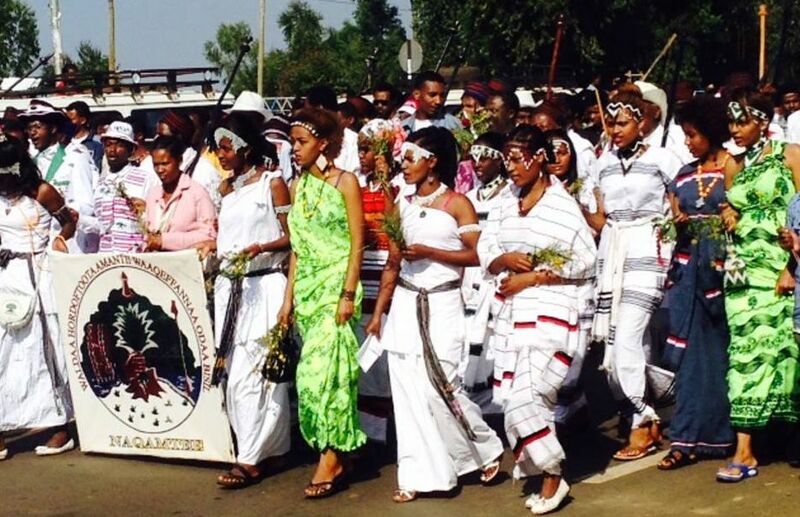 Irrecha is celebrated throughout Oromia and around the world where diaspora Oromos live especially North America and Europe. 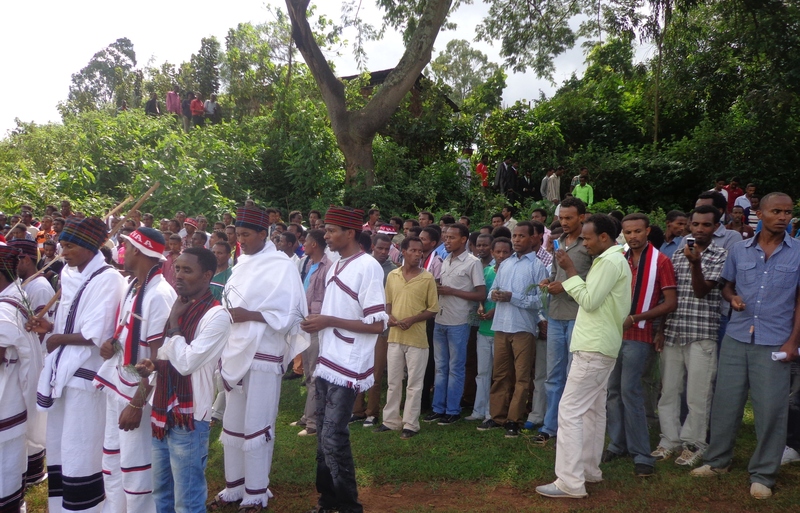 The Oromo people consider the winter rainy season of June to September as the time of difficulty. 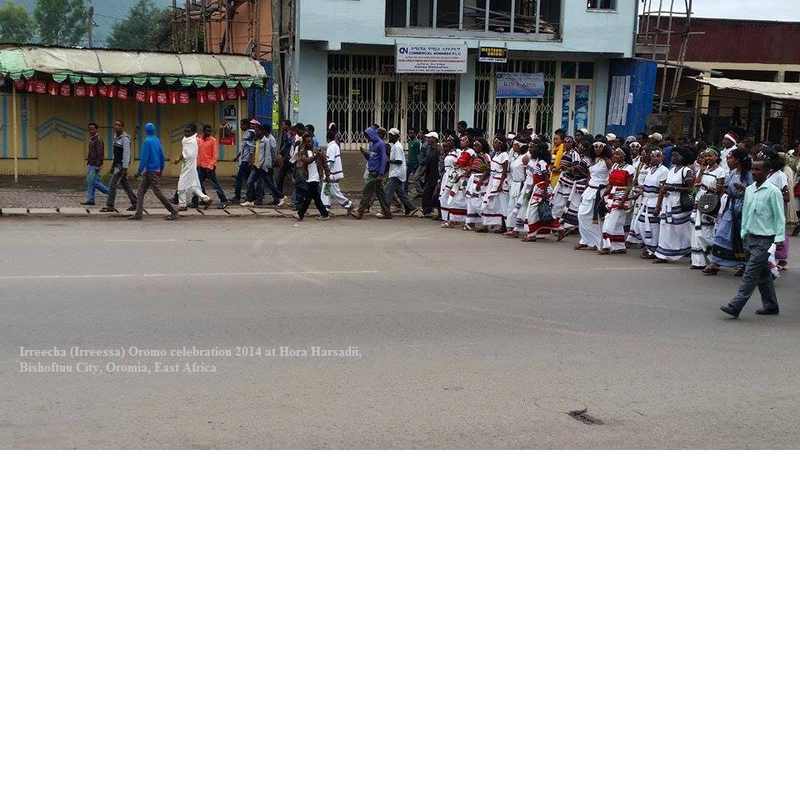 The heavy rain brings with it lots of things like swelling rivers and floods that may drown people, cattle, crop, and flood homes. 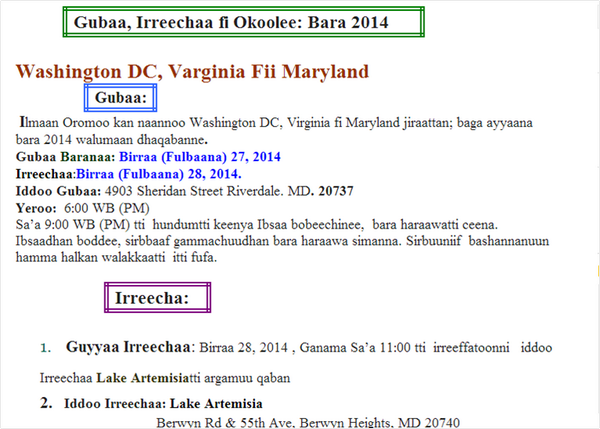 Also, family relationship will severe during winter rain as they can’t visit each other because of swelling rivers. 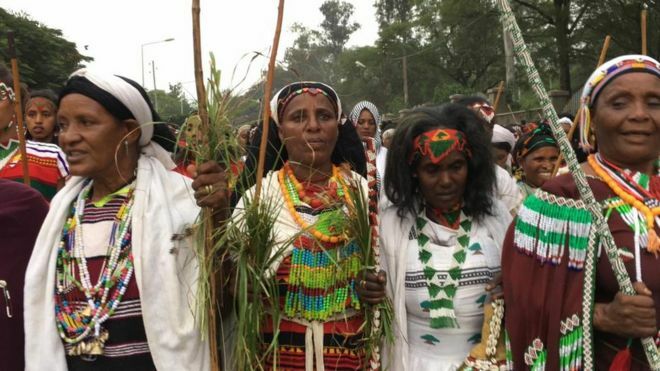 In addition, winter time could be a time of hunger for some because of the fact that previous harvest collected in January is running short and new harvest is not ripe yet. 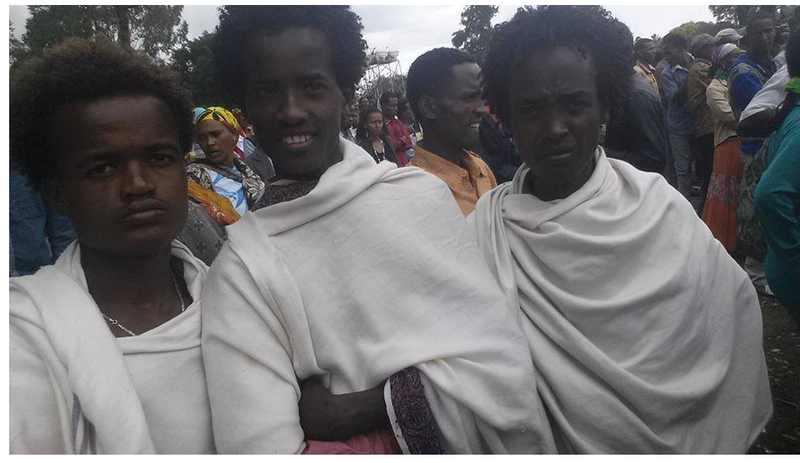 Because of this, some families may endure food shortages during the winter. 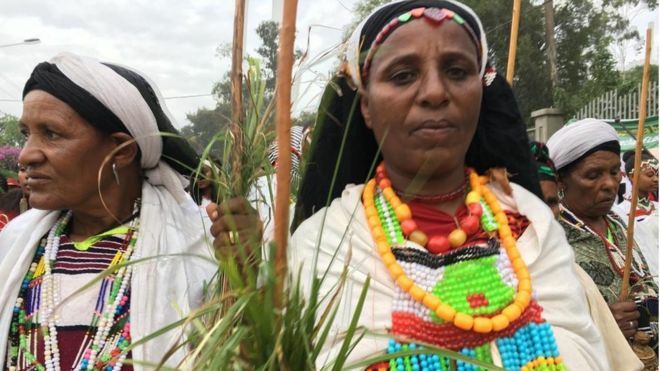 In Birra (the season after winter in Oromoland), this shortage ends as many food crops especially maize is ripe and families can eat their fill. 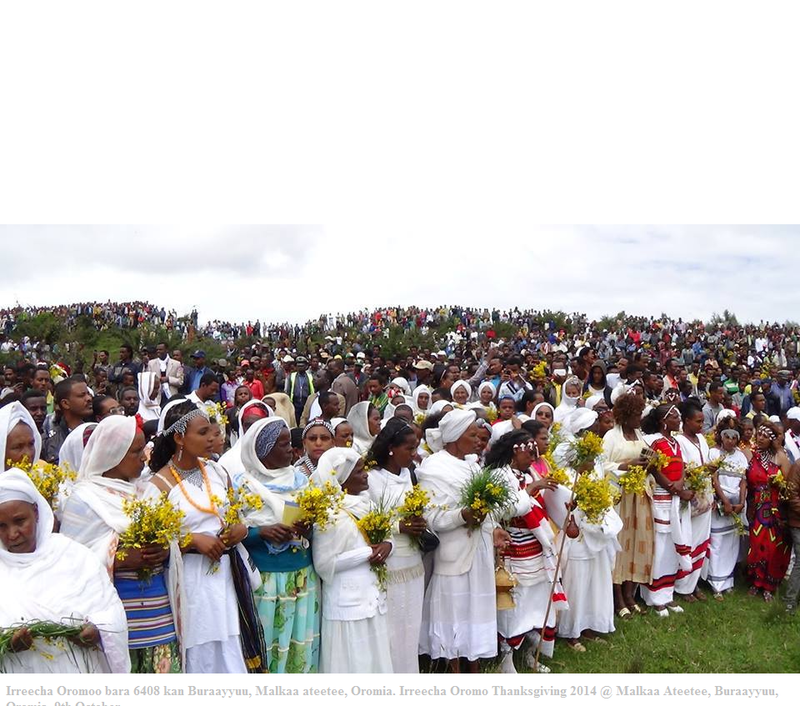 Other crops like potato, barley, etc. 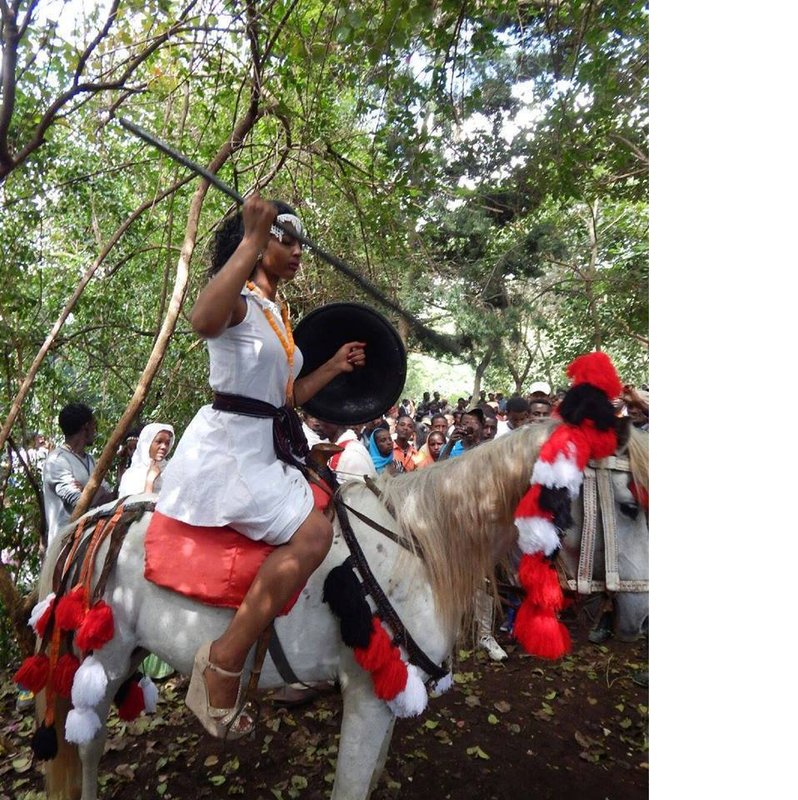 will also be ripe in Birra. 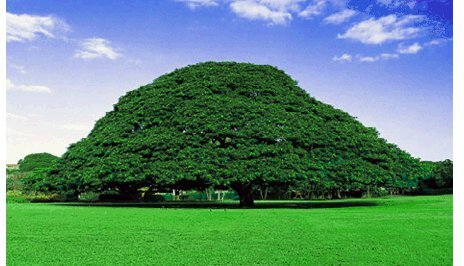 Some disease types like malaria also break out during rainy winter time. 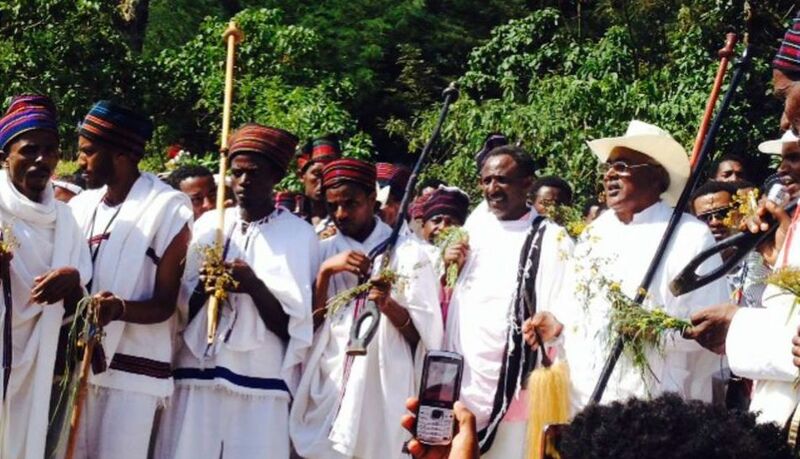 Because of this, the Oromos see winter as a difficult season. 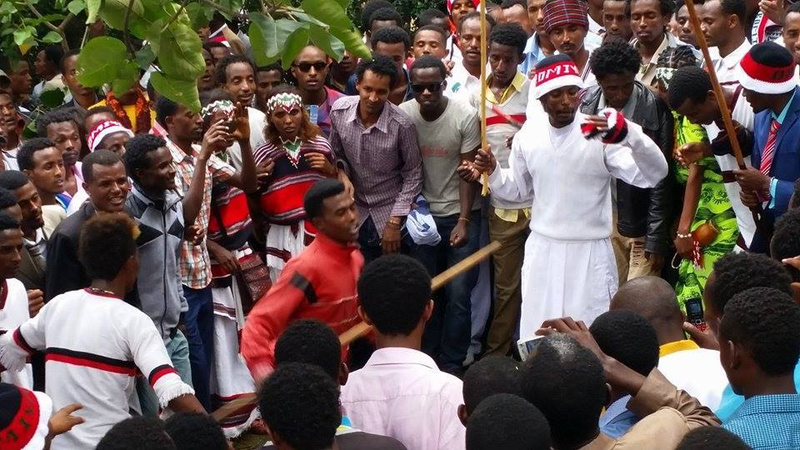 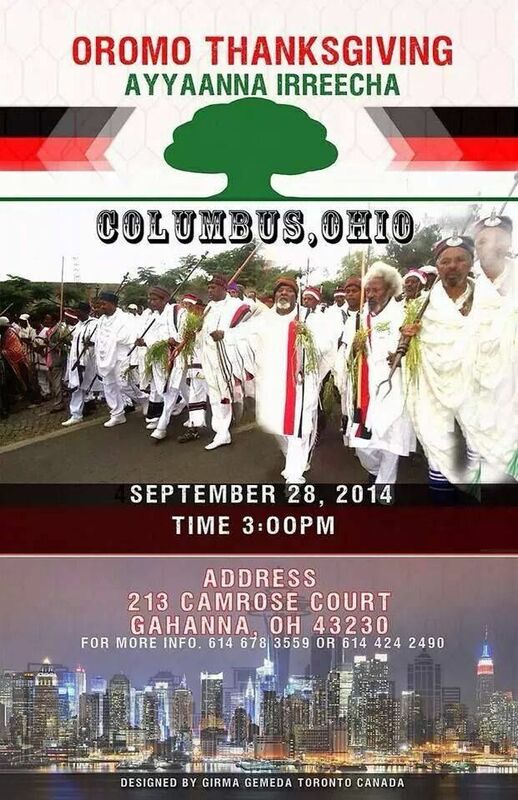 However, that does not mean the Oromo people hate rain or winter season at all. 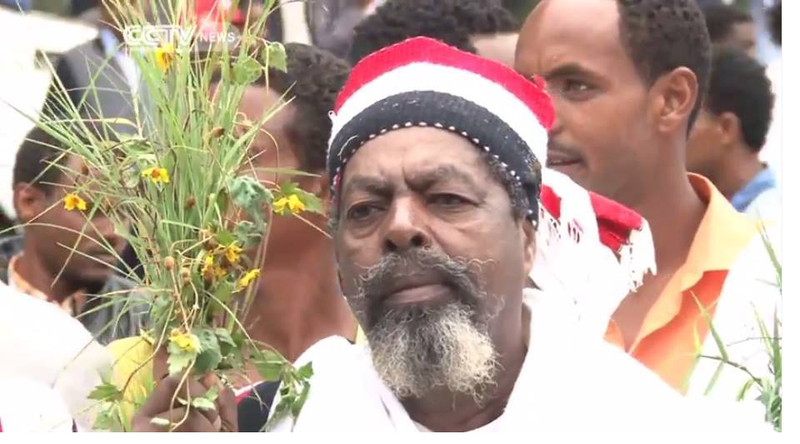 Even when there is shortage of rain, they pray to Waaqaa (God) for rain. 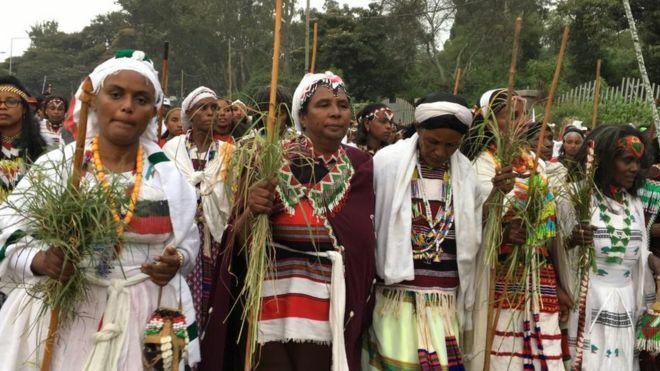 The Oromo people celebrate Irreechaa not only to thank Waaqaa (God) but also to welcome the new season of plentiful harvests after the dark and rainy winter season associated with nature and creature. 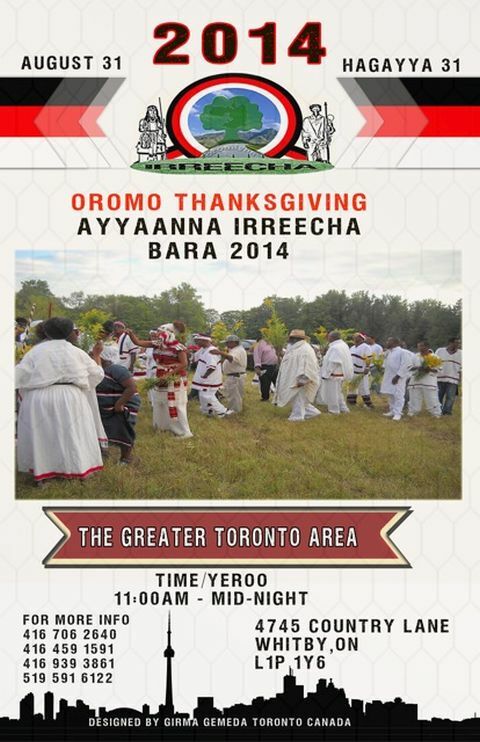 On Irreechaa festivals, friends, family, and relatives gather together and celebrate with joy and happiness. 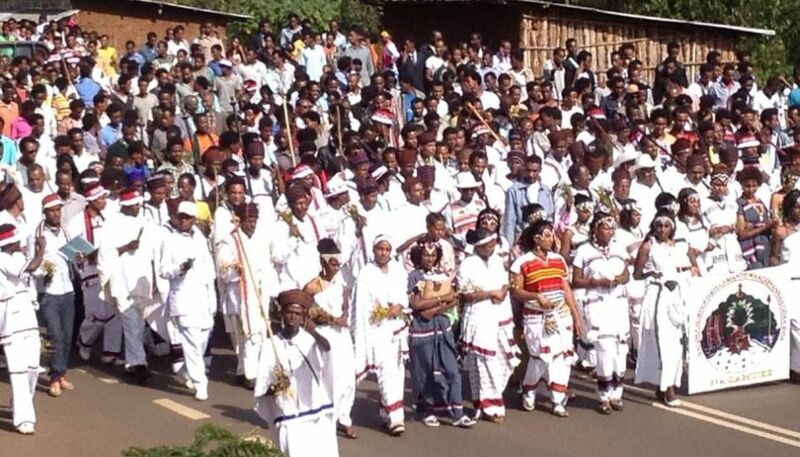 Irreechaa festivals bring people closer to each other and make social bonds. 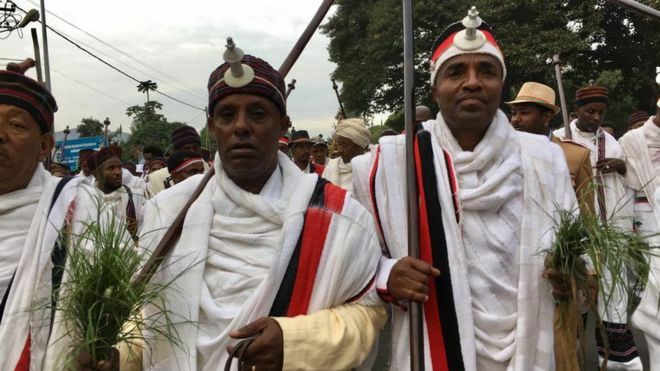 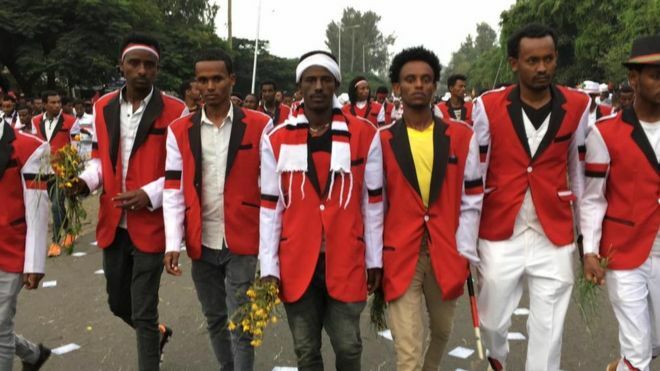 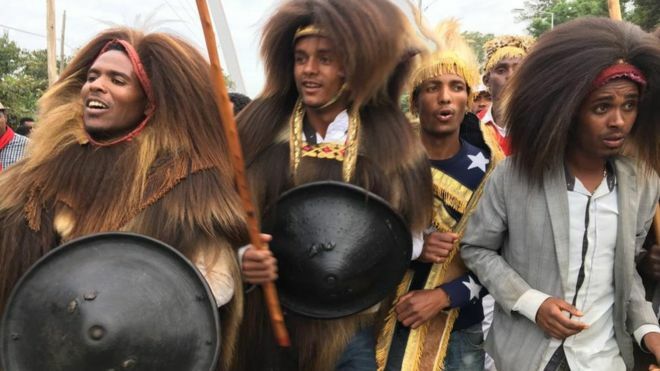 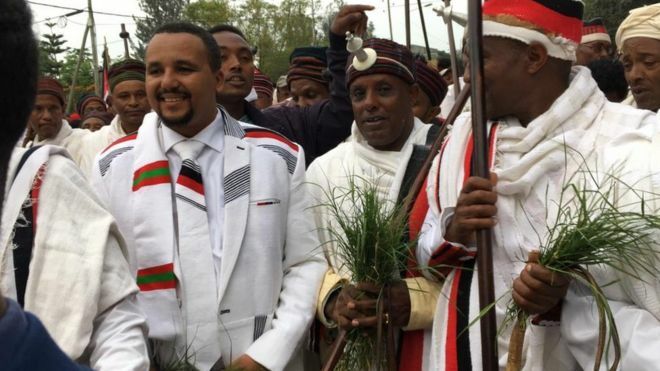 Moreover, the Oromo people celebrate this auspicious event to mark the end of rainy season, known as Ganna, was established by Oromo forefathers, in the time of Gadaa Melbaa in Mormor, Oromia. 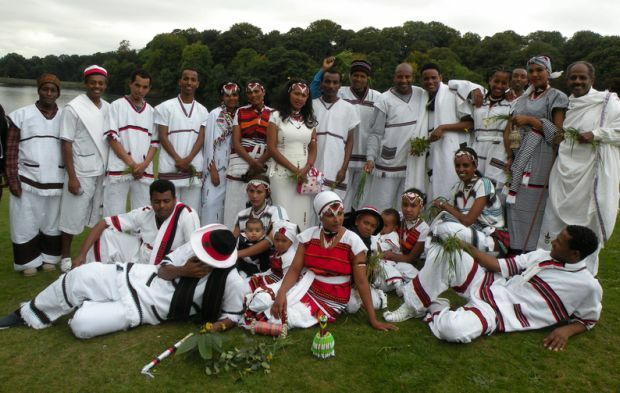 The auspicious day on which this last Mormor Day of Gadaa Belbaa – the Dark Time of starvation and hunger- was established on the 1st Sunday of last week of September or the 1st Sunday of the 1st week of October according to the Gadaa lunar calendar has been designated as National Thanksgiving Day by modern-day Oromo people.